Videos - Whose Is That Face in the Shadows? Whose Is That Face in the Shadows? Sorry about the lack of screencaps, I haven't gotten around to making them yet. I'll be updating them slowly. Sorry! NOTES: Julian Ovenden's final performance. He performed in the first scene after which the show was stopped and an announcement was made that his understudy Kevin Earley (who would replace Ovenden from that night on) would resume the role in a moment. Disc also includes cast/creative interviews, reviews and opening night footage. Golan Yosef, Nathalie Fauquette, Gregory Deck, Lola Ces, Ginie Line, Julien Loko, Anais Delva, Aymeric Ribot,Florent Torres, Laurent Levy, Sébastien Sfedj. Cast: Richard Fleeshman, Caissie Levy, Moya Angela (u/s Oda Mae), Bryce Pinkham, Tyler McGee, Lance Roberts, Michael Balderrama. Cast: Michael Ball, Mel Smith, Leanne Jones, Ben James-Ellis, Tracie Bennett, Elinor Collett, Johnnie Fiori, Adrian Hansel, Rachael Wooding. when she was billed as Kristi D. Chenoweth. Nicely filmed, semi-pro shot, using one camera on a tri-pod. * In the first act MISSING about 25 minutes. The second act is fully present. 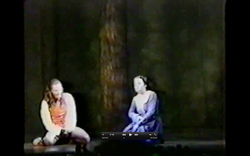 1997 London cast featuring Ian Glenn and (I believe) Rebecca Lock. Includes interview with White and Hathaway and White singing “Where in the World” in concert. 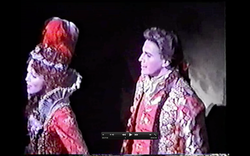 The Scarlet Pimpernel (SP2)-Broadway, May 8, 1999. Glenn Close, Alan Campbell, George Hearn. Seth Numrich, Alyssa Bresnahan, Matt Doyle, Boris McGiver, T. Ryder Smith. Cast: Mamie Parris (Elphaba), Amanda Jane Cooper (Glinda), Colin Hanlon (Fiyero), Stefanie Brown (Nessarose), Alma Cuervo (Madame Morrible), Mark Jacoby (Boq), Paul Slade Smith (Dr.Dillamond). Masters notes: Beautiful capture of Mamie's fabulous turn as Elphaba. Everything is nicely captured and performed. Alma still gives a great Morrible as does Stefanie as Nessa. A.